The film is expected to surplus the box office records of all time which is compared to the Hindi Mega hits films like Dabangg and 3 idiots. Rajinikanth looked fresh and perfectly matched with the Bollywood queen Aishwarya Rai. It seems that not only the Tamil people with a population of 65 million donot only accepted but also became popular between the Hindi speaking community grabbing the attention of 700 million people throughout the country and the world.Its been a shocking calculation - If there would be about 1700 prints ,the calculation would be a whooping Rs.500 Crore in the week which is unbelievable.About 200 crore is spend in the film Endhiran the Robot which is a ll time record in India. 3Idiots who raked in approximately Rs41 crore in the same period. But all this is history now. Robot has remade the box-office record in its own inimitable style. The USP of the film is "everything", including the special effects and Rajni Sir, according to Mr Nahta. Even those who haven't watched the film are gung-ho about the movie and plan to watch it in the days to come.The occupancy is 100% in South and more people are queuing up to buy tickets for which ever show they get, even if its after a week,” said Devang Sampat, president – operations, Cinemax India. The film is expected to garner over Rs 35-40 crore in the first three days from the South box-office alone. 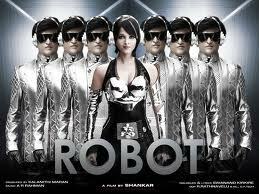 Robot (Endhiran in Tamil) is released across 2,000 screens, of which nearly 800-1,000 screens were in non-South markets. The movie is produced by Kalanidhi Maran-promoted SUN Pictures. “In some places tickets are being sold in black for Rs 5,000,” said film trade analyst Komal Nahata.Meanwhile, Ranbir Kapoor-Priyanka Chopra starrer Anjaana Anjaani too is sweeping the box-office with opening collections estimated to be over Rs 25 crore, according to industry experts.This weekend was the biggest weekend of 2010 for multiplex owners with both movies having a good start across India,” said BIG Cinemas COO Ashish Saksena.Sun pictures have less worry about south, mainly Andhra and Tamilnadu. For north, Sun has ensured no big competition at Robot release time in Hindi. Ranbir’s Anjaana Anjaani will be no direct threat as released on Sept 24th (update: It is postponed to Oct 1st now due to Ayodhya verdict) and Salman’s already super hit Dabanng will be in 4th week on Oct 1. This will help to avoid audience split. Still, one more fear is there. Ayodhya Babar-Masjid verdict is given on Sept 24th.